Damaged or missing teeth not only impact your self-esteem, but they also decrease your quality of life. Chewing your favorite foods can seem nearly impossible while you also live with daily discomfort. 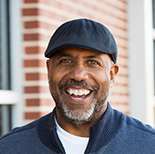 You can restore your smile with a bridge or a dental crown in Arlington Heights. At Costello Dental, we use cutting-edge technology to rebuild your smile. We have the customized solutions you need to invest in your dental health and your confidence. Every tooth in your mouth serves an important role in your oral health and functions. When even one is compromised or missing, it negatively impacts your ability to chew and speak. It is also easy to feel insecure about the damaged or lost tooth, which may cause you to avoid certain social settings. The latest advancements in dentistry can save your smile. Costello Dental uses cutting-edge innovations to rehabilitate your oral health. No matter if you need a crown or a bridge, we offer the solutions you need. 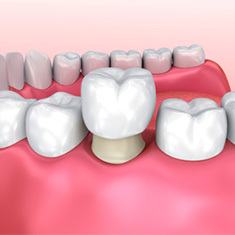 A dental crown is a custom-made cap placed over a tooth to improve its function, health, and appearance. They are widely used in restorative dentistry to treat teeth that have significant decay or fractures. In some cases, they are even used in cosmetic and preventive dentistry. It is not uncommon for them to be needed in combination with other procedures as well, such as root canal therapy or a dental bridge. We craft your crown to meet your exact needs. Digital impressions are taken to ensure it meets your size and shape needs. Using all-ceramic materials, it is customized to match the color of your remaining natural teeth to blend in with your smile. 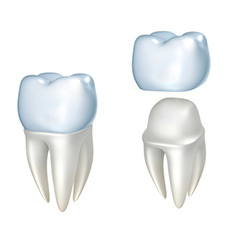 Although they are not made from metal, they are durable to protect your tooth for several years. With the right aftercare, you will enjoy a long-term solution to protect your teeth. On average, they last about 10 years before needing to be replaced. 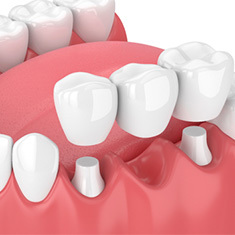 If you are among the 120 million Americans who are missing at least one tooth, we can rebuild your smile with a dental bridge in Arlington Heights. A row of prosthetic teeth is designed using impressions of your mouth. They are made to meet the size and shape you need to ensure the proper function. The bridge is then held in place by attaching crowns to the adjacent teeth. Now, you can eat your favorite foods and smile with confidence by filling the gaps in your smile. Your bridge will need to be replaced about every 5 years. To promote its longevity, it is best to maintain your oral hygiene and visit your dentist in Arlington Heights regularly. Do not let damaged or missing teeth hurt your oral health or self-esteem any longer. Get a healthy, functional smile today with a dental crown or bridge. Contact our office today to schedule your consultation. We look forward to saving your smile.